You are the Paperboy, and you must deliver the newspaper to the costumers on you bike, while avoiding crashing. 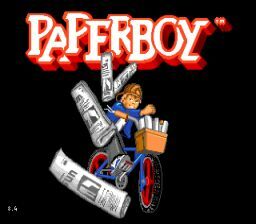 Paperboy is one of the most popular classic arcade games. It's a lot of fun and the graphics are pretty good. Paperboy is a huge classic, so if you are a fan of classic video games, you have to try this one. Ride the bike down the street and throw newspapers to the houses to score points. If you run out, just get a new stack. Avoid crashing. Remember that you can hit baddies with papers if you need to.